Israel has demolished at least 41 structures, including an elementary school, in one of the villages in the West Bank, leaving dozens of people homeless, the UN said. The current destruction trend is one of the highest on record in the West Bank since 2009. 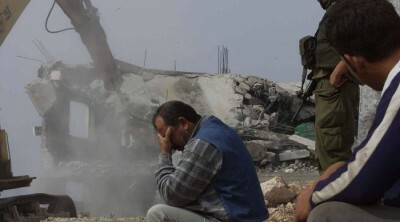 The latest demolition by the Israeli Civil Administration in Khirbet Tana, on the outskirts of Nablus city, “displaced ten families with 36 members, including 11 children, and affected the livelihoods of five additional families,” Office for the Coordination of Humanitarian Affairs (OCHA) for occupied Palestinian territory said in astatement. Khirbet Tana, a community of some 250 relying on herding and agriculture for their livelihood, is now left practically with no infrastructure. All in all, the destruction included 11 homes, five common bathrooms, one kitchen and 18 farming structures. Two traditional ovens and one solar system, all used for communal living were also destroyed. One of the demolished properties was an elementary school building which taught nine students. Twelve of the structures belonged to the Palestinian Authority and the Palestinian Red Crescent. READ MORE: 13,000 Palestinian buildings to be demolished in West Bank – UN report “These structures were demolished/damaged by Israeli forces due to lack of Israeli-issued building permits in Khirbet Tana, located in a closed military zone,” OCHA explained in their Facebook post. Because of the agricultural community’s close proximity to the IDF’s training “firing zone”, Palestinians are repeatedly denied building permits. READ MORE: Israeli president says govt has ‘right’ to build West Bank settlements According to the UN, around 18 percent of the West Bank is considered to be “firing zones” by the Israeli authorities, affecting some 38 Palestinian communities within these areas. Yet structures are continued to be built and regularly taken down. “Since the beginning of 2016, the Israeli forces have destroyed or dismantled 323 homes and other structures across the West Bank… displacing almost 440 Palestinians,” OCHA said, adding that more than half of those left homeless are children. Demolition of West Bank structures this year also resulted in income lost for almost 1,700 other people. What seems more troubling, the UN notes, is that 108 of those structures were provided as humanitarian assistance to families in need. “These are some of the highest levels of demolition and displacement recorded in a similar time frame since 2009,”OCHA said.